Aden Masonry, Incorporated, (AMI) is proud of its commitment to safety. This commitment is evident in the types of equipment we mobilize to each job site. All key personnel are trained and accredited in the safe operation of our equipment. Hydro-Mobile Mast Climbing Scaffolding: AMI maintains one of the highest ratios of power units to personnel, in Southeastern Washington. 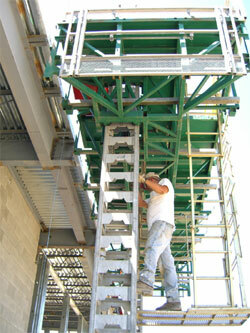 Hydro-Mobile scaffolding (www.hydro-mobile.com) was chosen for its excellent safety and ergonomic record. We utilize the M1, M2 and P series units and accessories. All of our foremen and lead hod carriers are factory trained and highly competent in the utilization of this equipment. AMI has an extensive inventory of Safway scaffolding and exclusive use of laminated planking, due to its high strength and durability. Our forklift operators have attended factory training and have current operator licenses. All AMI forklifts have onboard GPS tracking to facilitate on-time maintenance and repairs, which are performed by factory personnel under service contract with Caterpillar (www.westernstatescat.com). We also have eight other small lifts which complement our large-capacity lifts, depending upon your specific job needs. Our truck fleet is able to deliver equipment and materials to job sites in a timely fashion. AMI's shop/yard team is a key part of the successful operations of AMI, from the managing and maintenance of equipment, to making sure that each and every job has all the needed hand tools, safety equipment or miscellaneous goods. Our Yard Manager, Mel Garvin, not only oversees day to day operations but is also our in-house custom fabrication specialist, with the ability to design and construct equipment as needed. AMI has a large inventory of miscellaneous job related supplies, along with its inventory of equipment parts and small tools. Our ample supply of mortar mixers, grout pumps, block and brick saws and other necessary equipment ensure our ability to complete your masonry project, whether large or small. We stock enough replacement equipment for use during times that the job site equipment is out of service and/or being repaired. First Aid/CPR: All of our foremen and lead personnel have been trained in basic First Aid and CPR and keep their current cards with them at all times. https://fortress.wa.gov/lni/bbip/Search.aspx Please feel free to look up our contractor license information.